In addition to security for your computers and laptops, we also offers security for other items you may need to protect. Whether to meet privacy laws or comply with company mandates, we pride ourselves on finding a solution that works best for you. If you don't see anything within this site that is what you are looking for, give us a call as we have a solution! We offer several options to secure your iPad/Tablet. Padlocks and hasps are the mainstay of most security measures taken to protect your business. 1st-in-Padlocks.com offers a full line of MasterLock, American Lock and ABUS padlocks and hasps. Projectors and other AV equipment are tempting to thieves. Whether on a cart or on the wall or ceiling, we offer several different options to keep yours out of their hands. Our refrigerator locks can be used on your printer to secure the printer tray! 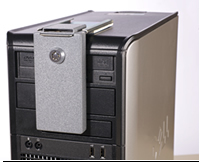 These CoverLocks can restrict or block access to ANY USB drive, CD Drive, on/off buttons, or network ports. These desktop chassis screws replace the one that comes standard with your PC. Prevent unwanted entry to your computer chassis's access door. Available with key control or as a security screw. Protecting computers in a computer lab or classroom can be challenging because the computers need to be easily accessible to the student. We offer several options to help ensure your computer equipment will be available when it's needed.